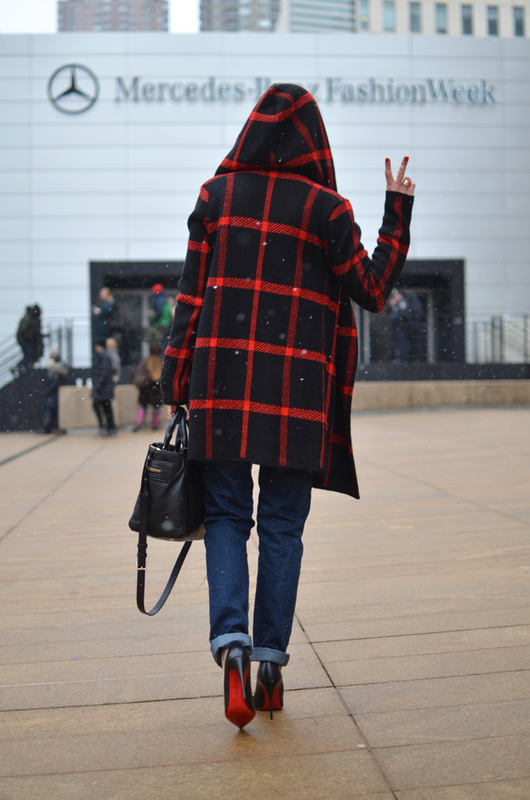 NYFW: A Dream Come True! Today was the last day of Mercedes-Benz Fashion week, an awesome Fashion rendez-vous where the best designers around the globe shared their Fall-Winter 2015 collections. Twice a year designers, buyers, celebrities, personalities and Fashion lovers gather to exchange about Fashion and the latest trends in the awesome New York City. This year and for the first time, I had the opportunity to attend various runways and shows at the renown Lincoln Center of Performing Arts. It was a crazy week that I would never forget. 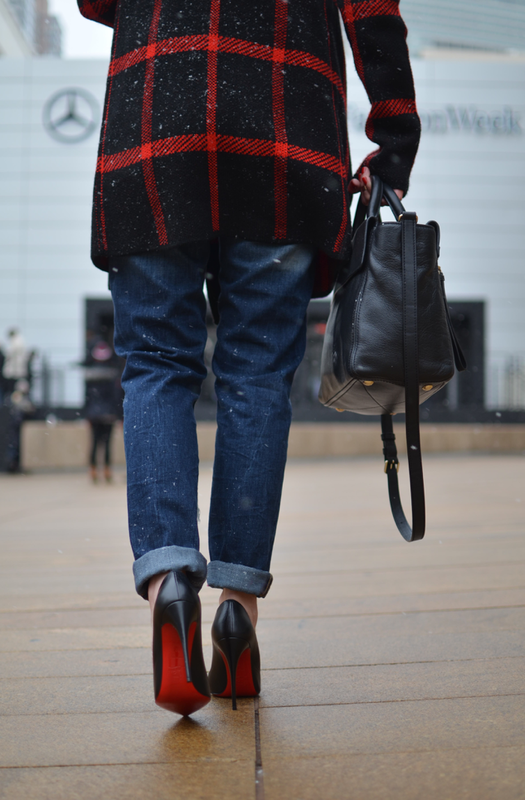 Here you have one my outfits during NYFW where I'm wearing a tartan sweater coat, boyfriend jeans and my beloved and new loubies that inject a touch of elegance and prestige to the outfit. A comfy look for a fashionable day in The City. Hope you like it! ;) And remember my Walk-ins: Dreams come true!!! Hoy fue el último día de la Semana de la Moda de New York, uno de los eventos de moda mas esperados a nivel mundial y donde los diseñadores mas prestigiosos de diferentes países se dieron cita para mostrar sus colecciones de Otoño-Invierno 2015. Este evento que se realiza dos veces por año no solo reúne creadores de moda sino además compradores, celebridades, personalidades y diferentes amantes de la moda interesados en conocer las tendencias venideras. Este año y por primera vez tuve la oportunidad de asistir y disfrutar de varios desfiles en el legendario Lincoln Center of Performing Arts. Fue una semana maravillosa que nunca voy a olvidar. Aquí les muestro uno de los outfits que llevé durante este importante evento, tartan suéter, boyfriend jeans y mis loubies, mis nuevos zapatos de ensueño que le impregnaron un toque de elegancia y prestigio a este look. Un atuendo perfecto para un día de Fashion en La Ciudad. Espero les guste! ;) Y recuerden mis Walk-ins: Los sueños tarde o temprano se hacen realidad!!! Le Château tartan sweater, Zara boyfriend jeans, Christian Louboutin shoes, Marc by Marc Jacobs bag, Forever 21 black sweater, Forever 21 rings, Ray-Ban sunglasses.